Can you believe Thanksgiving is already over?! This season has completely flown by. Sometimes I feel like I haven't made the most of it, because we haven't really gone to "do" anything. But then I see these gorgeous yellow leaves filling my yard and my kids having such a blast jumping into them, that I realize we didn't have to GO or really DO anything to enjoy the season. We were able to capture fun memories and quality family time from right here at home! I've been feeling a little burnt out on the whole blanket scarf trend, but this orange-y plaid really embodied all of my favorite fall colors and I just had to find a few ways to wear it while my backyard was so vibrant! 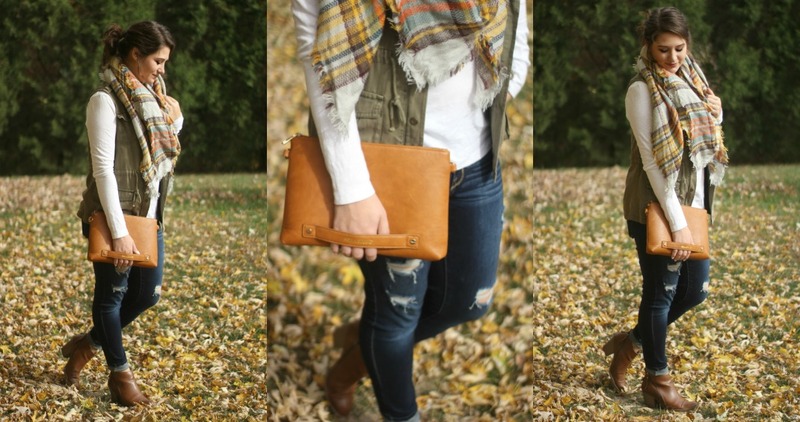 In case you missed it: You can see how I styled a blanket scarf with a belt here. Do you have any fall family traditions? How do you choose to layer your fall wardrobe?